Treat your inner surfing fanatic with a visit to Seminyak Beach, situated on the west coast of Bali and surrounded by luxury resorts, fine restaurants, and upscale boutiques. Despite the popularity of the surrounding area, this stretch of soft sand is usually uncrowded by foreign tourists, which means that on most days you can swim, surf, or just sit back in relative serenity. Local vendors sell cold beer right on the sand, while nearby bars and cafes offer a more varied menu of beverages and meals. Arrange to visit Seminyak Beach and other attractions in Seminyak using our Seminyak route planner . Nice and lively at night. But during the day there are many old Lady come close to sell the fruits, drinks and massage. I personally find that it is annoying. But the beach and the breeze was awesome. 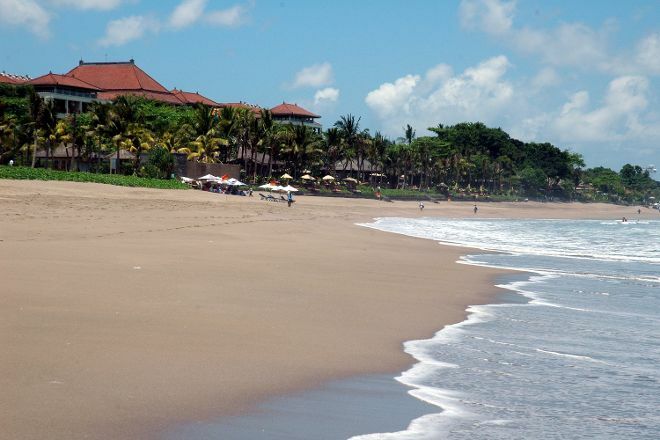 Seminyak beach also is one of the bucket list to cross in Bali! If you have to choose between Seminyak beach or Jimbaran beach, I would highly recommend Seminyak beach! A very clean and comfortable beach! Great vibes with nice food! Perfect! Every day, we help thousands of travelers plan great vacations. Here are some tips on how to use your Listing Page to attract more travelers to your business - Seminyak Beach. Promote your permanent link - https://www.inspirock.com/indonesia/seminyak/seminyak-beach-a742252885 - on your website, your blog, and social media. When a traveler builds a plan from this page, the itinerary automatically includes Seminyak Beach. This is a great way for travelers looking for a great vacation in your city or country to also experience Seminyak Beach. Promoting your link also lets your audience know that you are featured on a rapidly growing travel site. In addition, the more this page is used, the more we will promote Seminyak Beach to other Inspirock users. For best results, use the customized Trip Planning Widget for Seminyak Beach on your website. It has all the advantages mentioned above, plus users to your site can conveniently access it directly on your site. Visitors to your site will appreciate you offering them help with planning their vacation. Setting this up takes just a few minutes - Click here for instructions.